Empress. Tarot. Free Tarot. Free Tarot Reading. 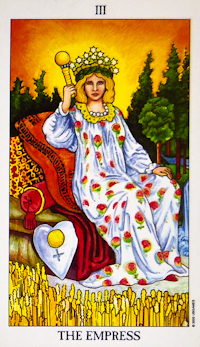 The Empress is also an aspect of the subconscious mind. While the High Priestess, number 2, is a memory, in number 3 we find the subconscious response to that memory that produces growth through the imagination. In contrast to the virginal High Priestess, the Empress appears pregnant, as does the landscape around her. The Empress produces. She is a great mother surrounded by love, beauty and growth. The conscious mind, key 1, cannot produce; the subconscious mind, key 2, cannot reason it takes a combination of 1 and 2 to produce the manifestation, or key 3. The trees, dress and wheat, symbolize the ripening that takes place in the subconscious mind. The stream is the life stream, the stream of consciousness. Falling into the pool, it represents the union of the sexes or the union of the conscious and subconscious minds. Her yellow hair, symbolizing the super-conscious mind, is tied by green leaves, or bound sunlight, as the leaves have captured the sun's rays. The twelve stars on her crown are the twelve zodiacal signs or the twelve months, thus representing time itself. In the same vein, it takes time to bring our desires into manifestation. she being with child cried, travailing in birth..." (Revelations 12: 'J, -2). Older versions of the Empress showed her with the crescent Moon beneath her feet.